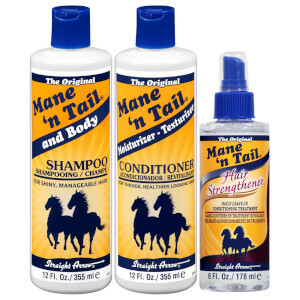 Treat lack-lustre hair to the benefits of Mane 'n Tail's Hair Strengthener; a leave-in conditioning treatment that works to moisturise, rejuvenate and calm unruly locks. Lightweight and non-greasy, the protective, alcohol-free spray defends against chemical and heat styling, whilst preventing breakage and split ends to leave hair soft, smooth and healthy-looking. 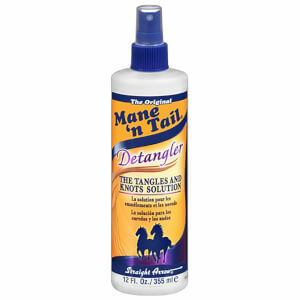 Effortlessly detangles hair and controls frizz for a salon-style finish. Spray onto dry or damp hair. 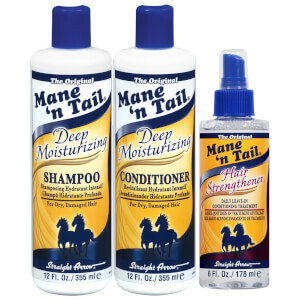 Comb through to distribute evenly throughout hair. No need to rinse. Style as desired. Water/Aqua/Eau, Propylene Glycol, Isostearamidopropyl Morpholine Lactate, DMDM Hydantoin, PEG-12 Dimethicone, Polyquaternium-11, Fragrance (Parfum), Polysorbate 20, Hydrolyzed Keratin, Aloe Barbadensis, Hydrolyzed Silk Protein, Polysorbate 80, Allantoin, Niacin, Panthenol, Retinyl Palmitate, with Extracts of*: Aesculus Hippocastanum (Horse Chestnut) Seed*, Equisetum Arvense (Horsetail) Leaf*, Larrea Divaricata (Chaparral)*, Spiraea Ulmaria (Meadowsweet) Flower*, Trifolium Pratense (Red Clover) Flower*, Tussilago Farfara (Coltsfoot) Flower*, Tocopherol, Cinnamal, Coumarin.